OXYWAVE BNC Connector For CCTV Camera goes through tough testing to ensure high grade materials and quality that provide secure connections. This BNC adapter is designed to connect two cables together. The full-form of BNC connector is Bayonet Neill Concelman. The basic BNC connector is a male type mounted at each of a cable end. This connector has a center pin connected to the outer cable shield. A rotating ring outside the tube locks the cable to any female connector. They can also be used to split a CCTV or video signal for distribution to multiple devices or locations. Each of these are rated to smoothly transfer 75ohm signals. The BNC splitter features a metallic nickel plated one another with 1 BNC male connector. High Quality - This connector is made with nickel-plated brass and a gold-plated pin for a reliable signal every time. Connect Rf Devices - Allows you to connect a wide range of RF devices that utilize the BNC connectors including video and Ethernet applications. 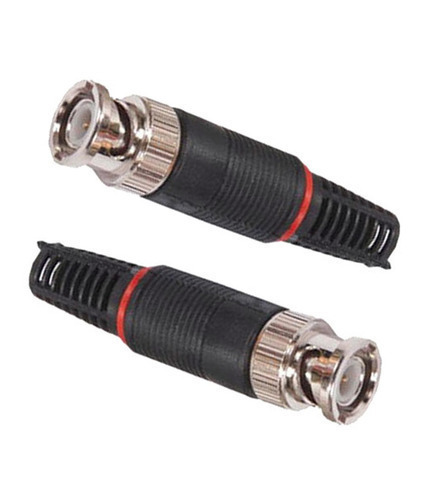 Use to Connect Coaxial Cables - Use to connect and create your own custom length BNC (coaxial) cable with this BNC male connector. Quality Control - Our BNC male connector goes through tough testing to ensure high-grade materials and quality that provide secure connections. Performance - This BNC connector can also be used to connect a CCTV or video signal for connection to multiple devices or locations. Established in the year 2009, Oxywave is one of the leading Manufacturer of Mobile Signal Booster, Power Adapters, Directional Yagi Antenna, LMR Cable, LPDA Antenna, and much more. Our range of products is manufactured according to the needs of our client. In order to maintain flawless production, we have a team of qualified and well-versed professionals. We are guided by Mr. Hari Ram Kurmi, who holds a rich experience in the engineering field.